Figure 1: The ASLESHA radar can scan the valley. Aslesha is a multifaceted ground based S-Band 3D Low Level Light Weight Surveillance Radar for deployment in diverse terrains like plains, deserts, mountain tops and high altitude regions. Aslesha detects and tracks heterogeneous air targets, including helicopters, fighters and UAVs at low and medium altitudes. It provides accurate range, azimuth and height information for each target with electronically steerable multi-beam technology in elevation. The radar sweeps 360 degree in azimuth and 30 degree in elevation to provide air space awareness. 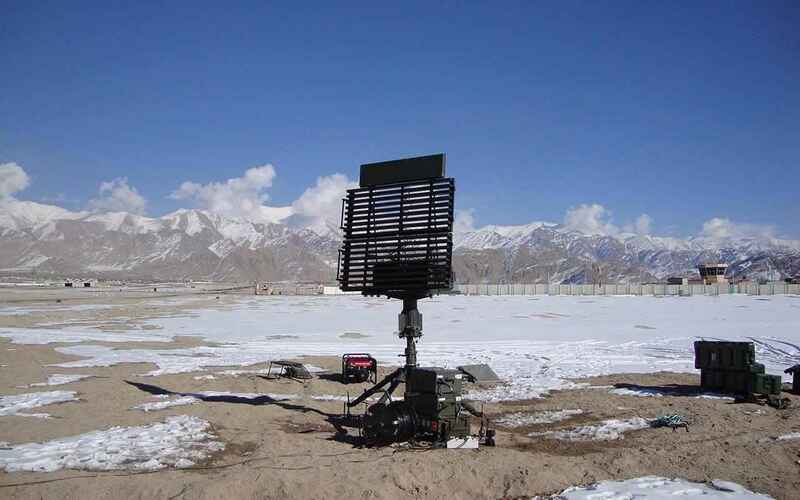 Semi- distributed active aperture radar uses advanced VLSI and high-speed digital technologies like high efficiency T/R modules, DDS, digital receiver and programmable signal processor to provide 3D air space awareness with high accuracy, resolution and reliability.